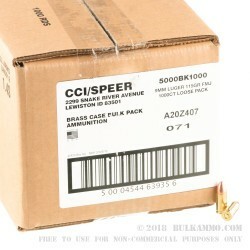 This 9mm Blazer Brass ammo by CCI is bulk packed loose in a 1,000 round case to provide additional savings to high volume shooters for their well known, quality range ammo. 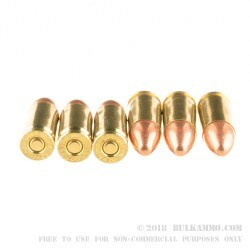 Each 9mm Luger cartridge features a 115gr full metal jacket (FMJ) bullet which flies out of the muzzle at 1145 fps. Concerned about recoil? This is a great round to practice with because the muzzle energy sits right around 335 ft/lbs causing a modest kick that won't tire your arms out right away. 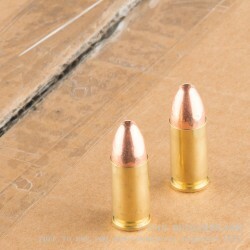 This ammo is available in 1000-round loose pack case. This ammunition is non-corrosive and is able to withstand an extended period in storage without negatively impacting its performance. 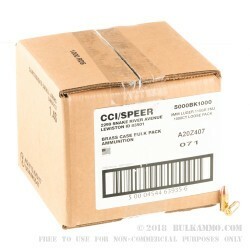 If you are a shooter looking to squeeze every last drop of value out of your ammunition, this 9mm Blazer Brass ammunition by CCI is for you. I use this in my glock 43 and ran over 600 rounds thru it. No problems whatsoever. I am satisfied with the brand and product.